First , install windows server backup. To have the permission to do the backup and restore, the user must be a member of Local administrators group, Backup Operators group, and Server operators group. Administrators have full rights to the server. Bare metal recovery – critical volumes needed to recover a server’s OS. It includes the system state, the system reserved volume, and the volume of the windows. System state – backs up boot files, Windows system files, and the Registry. Note: You can not do a bare metal recovery from backup stored on a dynamic disk. Tape is not supported in windows backup. Specify the destination – dedicated hard disk, volume, or shared folder. The free space of the destination should be at least 1.5 times the size of the files to be backuped. Internal Hard drive: must be NTFS, dedicated disk is recommended but not mandatory. External Hard drive: Usually used for off-site backup and disaster recover. You can only have one scheduled backup. To perform a scheduled backup, click Backup Schedule in the Actions pane of the Windows Server Backup console. Choose from once a day or multiple times throughout the day, By default, it runs at 9:00pm once per day. You must specify the destination for the backup –External drives are preferable. Confirm the scheduled backup and the backup will begin at the scheduled time each day. The task is Microsoft-Windows-WindowsBackup and changing the Triggers from daily to weekly, monthly, or other schedule according to your need. such as : to create a weekly backup at 19:00 Saturday night. You should always have at least one regularly scheduled backup. Then use a one-time backup for particular situations such as before a software or hardware upgrade. Backup performance can be optimized for backups of entire volumes. –Windows uses the Volume Shadow Copy Service (VSS) to perform full volume backups. VSS copies the volume block by block, Makes a mirror image of the volume. Normal backup performance: The full contents of the source volume are transferred, if a backup already exists on the destination, only the space required by the changed blocks is used. 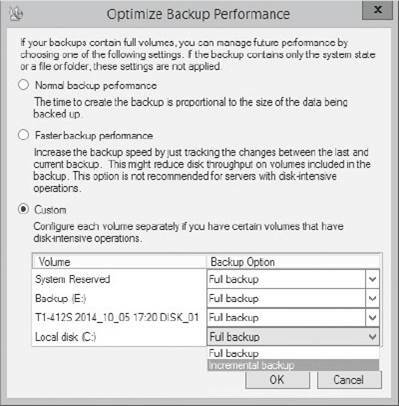 Faster backup performance( differential backup) : In this option only the changed blocks are transferred. The write performance on the source volume is decreased. In this option, windows Server backup still performs a full backup after 14 incremental backups have occurred or if more than 14 days have passed since the last full backup. Custom, you can choose full or differential backup for each volume. Use the vssadmin command-line program to configure the Volume Shadow Coy Service. You can create and delete shadow copies and list existing shadow copies. You can also revert a volume to an existing shadow, Overwrites the volume on a previously created shadow copy. The revert option requires that no files be open on the volume to be reverted. Most server role data is stored in locations that are backed up if you perform a backup containing the system state. Some roles, features, applications, and services register themselves with Windows Server Backup. Authoritative restore – after AD is restored, the DC replicates to all other DCs in the domain, and any changes made to AD objects since backup are lost. Nonauthoritative restore – changes made to AD objects on other DCs since the backup are kept and replicated to the server being restored. System state recovery requires the following backup types are available: system state, bare metal recovery, or full server. Bare metal recovery (BMR) – perform this task when server has suffered catastrophic failure. You need to be able to boot to the Windows installation medium.If restoring a VM, use an ISO file of the installation medium. You will still have a backup failure for the backup disk is full after a running scheduled backups a couple of times. The truth is, WBS will stop automatically deleting old backups when WSB can no longer track the space allocated for snapshot. As you know, backups created by WSB cannot be deleted in File Explorer. To free up more space for new backups, you can use WBadmin command to delete old backups from the command prompt. wbadmin get versions: lists details of backups recoverable from the local computer or, if another location is specified, from another computer. -machine: the name of the machine being backuped. -backupTarget : the location of the disk to store the backups. The parameter “-machine” is only needed when you have backed up many computers to the same location. In Windows Server 2008R2 or previous versions of Windows Server, WBS will not allow you to directly delete non-system state backups. As a workaround, you can delete the corresponding shadow copy on the backup target location. 1. Type: “DiskShadow.exe” in an elevated command prompt and press Enter. 2. Type the command: “delete shadows oldest G:” The parameter “G” has to be replaced with your backup drive letter or volume GUID. -keepVersions Specifies the number of the latest system state backups to keep. The value must be a positive integer. The parameter value -keepVersions:0 deletes all the system state backups. -version Specifies the version identifier of the backup in MM/DD/YYYY-HH:MM format. If you do not know the version identifier, type wbadmin get versions. -deleteOldest Deletes the oldest system state backup. -backupTarget Specifies the storage location for the backup that you want to delete. The storage location for backups of disks can be a drive letter, a mount point, or a GUID-based volume path. This value only needs to be specified for locating backups that are not of the local computer. Information about backups for the local computer will be available in the backup catalog on the local computer. -machine Specifies the computer whose system state backup you want to delete. Useful when multiple computers were backed up to the same location. Should be used when the -backupTarget parameter is specified. -quiet Runs the subcommand with no prompts to the user. Windows Recovery Environment (Windows RE) – a special boot option used to solve common Windows startup problems. Comes standard in Windows Server 2012/R2, Windows 8/8.1, and later OSs. If Windows Server 2012/R2 fails to start twice in a row, Windows RE starts automatically. Also, if there are two unexpected shutdowns within two minutes of a successful boot or if there’s a Windows Secure Boot failure. bcdboot: Configures or repaires system partition. Can also used to boot to a virtual hard disk. sfc( system file checker) : Verify the versions of the protected system files. If a protected file has been overwritten, this tool retrieves the original version from \windows\system32\dllcache. –Startup Settings: F8 to display. –Enable low-resolution video: for video troubleshooting. BCD contains settings that determine how a Windows system boots, Usually on the reserved partition. – /enum: List the boot entries. Add /v to show the verbose mode. Windows boot manager: the program loaded by Computer’s BIOS that reads the BCD to see which OS are installed and available to boot. The Windows Boot loader: describe the installed OS and where it is located. Note that To use MS Azure backup, you must schedule a backup first.